University of Guelph researchers studying the intimate structure of edible fats are getting help from the United States Department of Energy (DOE). The researchers hope to replace unhealthful trans and saturated fats with better non-saturated versions — all without compromising texture. That swap could have great implications for the food industry, says Maria Fernanda Peyronel-Svaikauskas, a research associate working with food scientist Prof. Alejandro Marangoni. To conduct their studies, Peyronel-Svaikauskas and the other U of G researchers use the DOE's Advanced Photon Source (APS) at Argonne National Laboratory in Lemont, Illinois. X-rays generated at that facility enable scientists to study and characterize the structure of edible fats at meso and micro levels (hundreds of nanometres to a few micrometres in size). Edible fats are made of triglycerides that clump to form crystalline nanoplatelets (CNPs), which in turn form larger masses of particles. The researchers use the APS to study those larger structures inside and out. Unlike using conventional microscopy, using X-rays means researchers need not condition or manipulate samples for in-situ measurement. Peyronel-Svaikauskas says trans and saturated fats are important because they provide structure for semi-solid edible fats such as shortening or butter-like spreads. But "as soon as the healthier unsaturated fats are used to replace the trans and saturated ones, the solid structure is lost," she says. "The key problem is the food industry trying to do this with much trial and error. We are trying to help them with our research by removing the trial and error." Researchers have looked at fats using other sophisticated imaging techniques for decades. The Guelph team uses new technology at the APS called ultra-small angle X-ray scattering for the first such structural analysis of fats and oils. The researchers model CNPs in computer simulations to guide experiments and predict outcomes. Researchers need to propose experiments and book APS time through the DOE. Peyronel-Svaikauskas says they need to be ready to go to Illinois and squeeze a lot of work into eight-hour shifts, all in a high-security facility. "You feel like you don't want to touch anything, and every step you take, there is someone telling you what or what not to do. You're always concerned that you're going to press the wrong button or that the alarm will sound. It's tense." 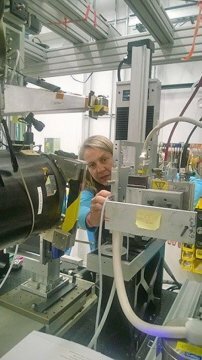 Radiation is a concern when working with X-rays, but she says researchers can accomplish a lot using the high-flux, high-energy X-ray beams at the APS. "You're looking at X-ray scattering at really tiny angles. The smaller the angle, the larger the feature you look at in your sample. That's important if you want to understand how the meso to micro structure gets formed." They found characteristic patterns normally missed by conventional wide- or small-angle scattering. Their computer models and predictions helped them understand what was happening to fat structures. Food scientists may use this information to decide whether they have the desired product for a particular purpose, such as a spreading or a fat to make cookies or to get the best chocolate. "When you think about the amount of applications for fat, it's tremendous," says Peyronel-Svaikauskas. "It's hard to say that what you see in one system can be translated to another system because you are talking about different molecules, and each one has to be processed according to the functionality you want at the end." By understanding the structure of unhealthful fats, she hopes to advise industry when substituting an unsaturated fat for a saturated one. The above post is reprinted from materials provided by University of Guelph. Note: Content may be edited for style and length.